We Sell Only the Newest Edition that is Published Today. We purchase direct from MotorAge and sell hundreds of the ASE test Prep Manuals every week. Anytime there is a change in the manuals content we return old copies in exchange for new editions. The B2 ASE Test Task List, which lists the knowledge that a technician must have to pass the B2 ASE test. Extensive Paint Application information, including Surface Preparation, and Paint Mixing and Matching procedures. Spray Gun Operation, Adjustment and Maintenance procedures. Extensive Finish Defect information, including symptom descriptions and their causes and cures. Safety Hazards and Precautions information. A comprehensive Glossary, including all painting and refinishing-related terms used in the Study Guide. In addition to the easy-to-read text, the Motor Age B2 Painting & Refinishing Self-Study Guide contains dozens of useful illustrations, and like all Motor Age Self-Study Guides, it is spiral bound, which allows the pages to lie flat for ease of use. 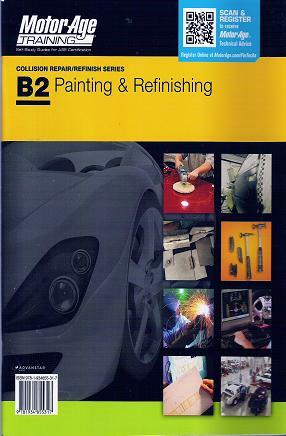 You ll also find the Motor Age B2 Painting & Refinishing Self-Study Guide to be a handy reference manual that you can use on the job after you ve taken the ASE test.